Ceremony in Pretoria, South Africa, December 12, day before opening of World Festival of Youth and Students there, celebrates role of Cuban internationalist fighters in helping defeat South African apartheid regimes invasions of Angola in 1970s and 80s. PRETORIA, South AfricaAt a joyous and militant ceremony here, hundreds of young Cubans paid tribute to Cuban internationalist fighters who lost their lives fighting, jointly with Angolans and Namibians, against the South African apartheid regimes invasions of Angola beginning in 1975. The Pretoria event took place December 12 in Freedom Park, whose patron-in-chief is Nelson Mandela. A wall in the park lists the names of some 75,000 people who lost their lives in the struggle for freedom in southern Africa, from precolonial struggles until today. In 2006, the names of more than 2,000 Cubans who fell in the Angola war were added to the wall. 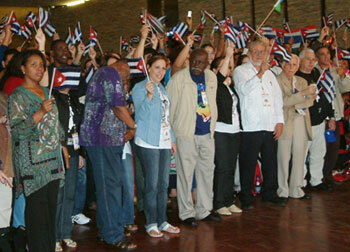 The Cubans present for the ceremony are in Pretoria for the 17th World Festival of Youth and Students taking place December 13-21. Present for the ceremony were a number of prominent participants in the Angola campaign and other Cuban internationalist missions in Africa. They included Jorge Risquet, a member of the Central Committee of the Communist Party of Cuba, who went to Congo-Brazzaville in 1965 to assist the liberation forces there. Risquet was head of Cubas civilian mission in Angola from 1975-80. In his remarks at the Wall of Names event, Risquet listed the countries in which combatants from Cuba have fought, including Algeria, Congo, Congo-Brazzaville, Ethiopia, Guinea-Bissau, Cape Verde, Mozambique, and Namibia, as well as Angola. We salute the lives of all those who fought, Risquet said, giving special mention to Raúl Diaz Argüelles, first head of Cubas military mission to Angola. Diaz Argüelles was killed by a land mine on Dec. 11, 1975, just one month after going to Angola, almost 35 years ago to the day of the Pretoria ceremony, at which his daughter Natasha was present. The heroism of those who fought continues in the lives of the Cuban Five, three of whom fought in Angola, Risquet continued, referring to the Cuban revolutionaries who have been locked up in U.S. jails for more than 12 years. We demand their immediate release. Among the Cuban delegation and present for the event were Irma González, Antonio Guerrero, Jr., and Aili Labañino, children of three of the five. Others in the Cuban delegation who fought in Angola are Brig. Gen. Amels Escalante, Chief of the General Staff of the Cuban Military Mission in Angola from 1982-83; Commander René Hernández Gattorno who, with Diaz Argüelles, was one of the first to arrive in 1975; and Col. Fidencio González, hero of the Republic of Cuba and head of Cuban troops in the victorious battle at Cangamba, Angola. The delegation includes former combatants in other African nations: Commander Víctor Dreke was second-in-command to Che Guevara in the 1965 Cuban internationalist mission in the Congo and leader of Cubas military mission to Guinea-Bissau 1966-68; Rodolfo Puente Ferro led the medical section in the Congo-Brazzaville mission and was a former Cuban ambassador to Angola; and Col. Orlando Cardoso, Hero of the Republic of Cuba, who spent nearly 11 years as a prisoner of war in Somalia as a result of Cubas international solidarity with Ethiopia. Welcoming those present were Wally Serote, director of Freedom Park, and Ramzie Abrahams, head of Freedom Parks department of Heritage and Knowledge. Serote joined the African National Congress while in high school and was an activist in the antiapartheid struggle from then on. He was detained and placed in solitary confinement for nine months in 1969 under the apartheid regimes infamous Terrorism Act. He is today an internationally renowned literary figure and an ANC member. Why did we put the [Cuban] names on the wall? Serote asked. The answer is that those names stand for combat readiness, freedom, and peace around the world, describing the internationalist solidarity of the Cuban people and their government.